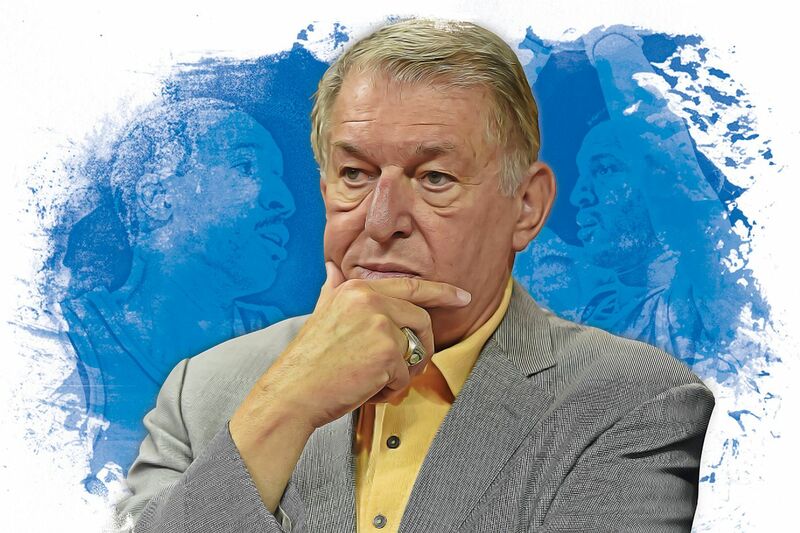 From the whisper-filled hallways and back channels open only to a person of his power, Jerry Colangelo had learned what was ahead for him and the Phoenix Suns in the spring of 1987: a drug scandal, and its subsequent fallout, that threatened to crush the basketball organization he'd built. Three players who were on Phoenix's roster at the time and two former Suns were indicted on charges of drug trafficking - a bombshell born of overzealous police and opportunistic prosecutors and dropped with the help of the team's star, Walter Davis. In exchange for immunity from any charges, Davis, who had previously twice entered drug rehab, testified before a grand jury that his teammates had used cocaine, and it didn't matter that most of the charges brought against the players were eventually dismissed, that none of them ever went to trial or served any time in prison, that the entire affair would be consigned to history as the worst kind of witch hunt. This was a year after Maryland star Len Bias died from overdosing on cocaine. This was at the crest of the "Just Say No" campaign. This was a problem that, at first glance, would make Jahlil Okafor's lead foot and flying fists seem like nothing. Before the story broke, Colangelo knew it was coming. He was the Suns' general manager then, and his contacts throughout Phoenix's civic associations had prepared him for the announcement, giving him time to craft a public response and chart a course that might keep the Suns from falling apart. "From what I gathered, they didn't have anything in terms of evidence, but we couldn't stop the train," he said recently in a phone interview from his Phoenix office. "And I remember just how the media responded, both local and national, like somebody wanted blood at that moment. I remember what I said: 'We need to let this process take its course. I believe that we have a position, and that position is people are innocent until proven guilty. But let's just see how this thing goes.' But immediately in my mind, there was a cloud hanging over the franchise." Colangelo has been the 76ers' chairman of basketball operations for a month and a half now. And for all the attention paid to the power dynamics between him and general manager Sam Hinkie, to the questions of who has final say over the team's personnel decisions, there was always a broader reason for his hiring, beyond the embarrassment the Sixers had become because of their won-loss record. It was no coincidence that Colangelo joined the Sixers just 11 days after Thanksgiving, when TMZ released a video of Okafor's involvement in a Boston street fight early that morning. The video's publication led to other troubling revelations about Okafor and the Sixers: that he'd had a gun pulled on him outside an Old City club in October, that the team had known about the incident, that police had stopped Okafor for driving 108 m.p.h. on the Ben Franklin Bridge in November, that the Sixers and Hinkie bungled the public relations basics of the story by having only coach Brett Brown address the media in the aftermath. In that context, Colangelo isn't here for merely his experience and credibility but his crisis management skills, and with the Sixers facing the Suns on Tuesday night, his response to that infamous drug scandal offers some insight into what might be ahead here. "That was really the darkest period in our history," said Harvey Shank, the Suns' senior executive vice president and a member of the organization for 44 years. "But Jerry stood up and said, 'Look, here's what I'm going to do.' "
Colangelo had a two-front mission then, similar to the one facing the Sixers. Already, the Suns had been failing on the court. They went 36-46 in 1986-87, the third of what would be four consecutive losing seasons. With the scandal, they had become a punchline off the court, too, and Colangelo first had to restore stability, and the appearance of stability, to the franchise. "It was a matter of staying transparent," he said. Dealing with it, for Colangelo, required a move that he won't attempt with the Sixers: Using an option within his general manager's contract and seizing on ownership's nervousness about the team's future, he put together a group of investors and, for $44 million, bought the Suns in October 1987. But by then, he already had begun a campaign to reassure both the NBA and the Suns' fan base that someone - namely, Jerry Colangelo - was in charge. During the summer of 1987, the Suns sent to every one of their season-ticket holders a VHS tape with on-camera statements of optimism and solidarity from Colangelo and players Larry Nance and Alvan Adams. Adams, who played 13 seasons for the Suns and is now their senior vice president of operations, still had a copy of the tape in his office at Talking Stick Resort Arena, and during a recent interview, he played the tape and repeated into his phone's mouth the message that Colangelo delivered: I see good things ahead. . . . We have been down for a couple of years. . . . This is our respected product. . . . We'll need some luck. "It was damage control," Adams said. "That's for sure." With his new player personnel director and coach, Cotton Fitzsimmons, Colangelo then set to reshaping the Suns roster, both to improve the team and to excise any lingering reminders of the drug controversy. After the 1987-88 season, for instance, once Davis's contract with them expired, the Suns didn't bother re-signing him. He played four more seasons thereafter, with the Denver Nuggets and Portland Trail Blazers. "It was tough for everybody, not just for Jerry and me," Davis said in a phone interview. "We weren't playing well, weren't getting the support like we had been because we were losing, and you could tell that the things we were going through were hard on the team. It was my fault." Now, here is the part of the story to which Okafor - who is the Sixers' best player and most valuable asset - might want to pay particular attention. In February 1988, Colangelo and Fitzsimmons accelerated Phoenix's rebuilding process by trading Nance - who was the team's best player and most valuable asset and who had no involvement in the scandal - another player and a draft pick to the Cleveland Cavaliers. In return, the Suns received point guard Kevin Johnson, center Mark West, forward Tyrone Corbin, and two draft picks. One of those draft picks turned out to be guard Dan Majerle, a fixture on the team for the next seven years. And for good measure, at 12:01 a.m. on July 1, 1988, the Suns signed forward Tom Chambers to the first unrestricted-free-agent contract in NBA history. After winning 28 games in 1987-88, the Suns won 55 in 1988-89, the first of seven straight seasons in which they won at least 53 games. And Johnson, Majerle, and Chambers - joined by Charles Barkley, acquired later in a trade with the Sixers - helped the Suns reach the NBA Finals in 1993. Whether Colangelo and Hinkie will remake the Sixers to the same degree in the months and years ahead remains to be seen, of course. Because the Sixers have Okafor and Nerlens Noel on their roster, Joel Embiid and Dario Saric presumably on the way next season, and potentially four first-round picks in this year's draft, it makes little sense for them to start making radical, franchise-shaping moves before they have a sense of how that core of players and pieces might develop. But as those dark days in the desert years ago proved, that doesn't mean Colangelo won't be willing to make them. "As I look at the Philadelphia situation, it certainly is an opportunity for me to take what I could bring to the table in terms of my experiences, my work record, my strengths, and any weaknesses, too, and try to make a contribution to helping the franchise go the other way," he said. "I'm an eternal optimist. I really am. When people have said to me over the years, 'You can't do that,' my response is, 'I think I can. I think I will. And I believe I'll show you how.' "